Hunter Blade is a Chinese developed online game in which players hunt monsters. It doesn't look a little like Capcom's Monster Hunter. It looks a lottle like Monster Hunter. When the game was first shown in spring 2009, Capcom issued a statement: "This title is not licensed by us and has no connection to our company." Yet, the title presses on. 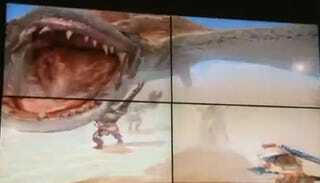 The trailer shown at the ChinaJoy gaming expo depicts enemy monsters that look so much like to the ones in Monster Hunter. What's more, the sword design appears to be very similar. Certainly, Capcom cannot stop companies from making games that have monster hunting in them. But this is okay? Really?